What I enjoy about Jeannie Lin's historicals is how accessible she makes the history - Tang Dynasty China - to ignorant westerners like myself. What I know about Chinese history couldn't fill a thimble, but while I'm reading her stories I never feel lost, bored, confused or indifferent to the surroundings the characters live in. 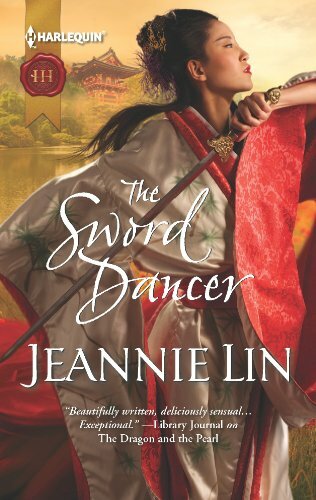 The Sword Dancer continues with this tradition, and gives readers a more action-packed story compared to last year's more quietly restrained My Fair Concubine. Li Feng is a sword dancer, traveling with various troupes, and making her living performing. Well, sort of. She's also fallen in with a rough crowd and was part of a jade and gold heist. It was a sizable enough fortune, on its way to a powerful man, that she's now caught the interest of one of the most feared thief-catchers in the area - Zheng Hao Han. This guy is so good at his job, so well-known for bringing in notorious bandits, tall-tales of his exploits abound. I mean, everybody knows this guy. Now it seems he's dead-set on bringing Li Feng in. Too bad she's not willing. Looking for answers, hoping to unravel the mystery of her past, she's got no time to indulge a thief-catcher - no matter how handsome he is. Lin has written stories in both urban and frontier settings, which has brought to mind how similar her Tang Dynasty playground is to the historical American west. Nowhere is that more evident than in this story. You have a thief-catcher (bounty hunter, Texas Ranger, sheriff etc.) going after a bandit (outlaw, criminal, cattle rustler etc. ), with themes of redemption (for both Han and Li Feng) and revenge (Li Feng's unknown past) playing heavily into the plot. For most of this story the characters are drawn together just as they are working at cross-purposes. Han has a strict moral code and a very defined definition of right vs. wrong and justice. The irony is that thief-catchers, while a necessity to law and order of the land, are not highly thought of. It was a blow to Han's father (a magistrate) when his eldest son chucked his scholarly studies aside to chase after wanted criminals. So while Han may be somewhat of a legend to many, he's still a shadowy figure. The way he lives, the way he makes his way in the world? It's not exactly revered. Li Feng wants answers, having lost her parents at such a young age that she's struggling to find out what happened to them. All she has is a piece of jade her mother left her. She doesn't know her true name, she doesn't know anything about her family, and given that she was only a toddler at the time, has very vague memories of anything prior to her life before meeting her shifu. Naturally she's not happy to have Han chasing after her, but soon they find themselves not only working together, but drawn to each other. Never mind that the attraction could be nothing but disastrous for both of them. I enjoyed this story a lot. There's plenty of action packed in the pages to keep the story chugging forward, and the forbidden nature of the romance makes for some delicious moments of angst. Lin has always done well placing strong emotional moments in her stories, moments where you really bleed for the characters and know exactly what they're feeling, going through, and tormented by. Li Feng and Han may start out as doomed lovers, destined to never find their way to their happy ending, but Lin makes it work, gives us our happy ending, and in such a way that it's completely plausible. I ADORE Jeannie Lin's books. I need to read this one now. hahaha.